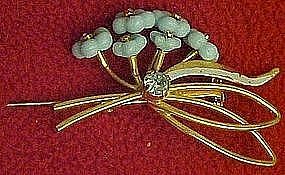 Vintage Austria pin, blue glass flowers, gold tone. Elegant vintage pin is made in Austria. Little blue forget me not flowers are made of formed glass beads, and are accented by a single large blue rhinestone. Measures 1 1/2" x 2". Pretty shiny gold setting. There is minor wear on the paint area of the ribbon, otherwise the entire pin is excellent.